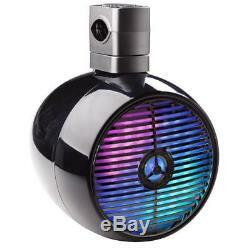 Pair of Waterproof Marine Tower Speakers Wakeboard Subwoofer with Led Lights. Includes (2) Wakeboard Tower Speakers. Waterproof Marine Grade Rated Construction. 2-Way Full Range Audio Speaker System. Built-in Illuminating Multi-Color LED Lights. Rugged, Durable & Sleek Housing Design. Integrated Universal Roll Bar Mounting Clamps. Anti-Corrosion: Weather-Resistant / UV Resistant. Used for Boat & Marine Vehicle Watercraft Applications&##xA0. What's in the Box. Power Output: 300 Watt MAX. Sound System: 6.5'' Subwoofers, 1.0'' Tweeters. Boat Roll Cage / Roll Bar Support Size: Up to 2.36'' (6cm). Housing Construction Material: Engineered ABS. Speaker Housing Dimensions (L x W x H): 8.4'' x 12.3'' x 9.4'' -inches (with Mounting Bracket, Each). We strive to have the best customer service possible so be ensured you will be happy purchasing with us! The item "Pair of Waterproof Marine Tower Speakers Wakeboard Subwoofer with Led Lights" is in sale since Thursday, May 10, 2018. This item is in the category "Consumer Electronics\TV, Video & Home Audio\Home Audio\Home Speakers & Subwoofers". The seller is "deal-buys" and is located in United States. This item can be shipped to United States, Canada, United Kingdom, Denmark, Romania, Slovakia, Bulgaria, Czech republic, Finland, Hungary, Latvia, Lithuania, Malta, Estonia, Australia, Greece, Portugal, Cyprus, Slovenia, Japan, China, Sweden, South Korea, Indonesia, Taiwan, South africa, Thailand, Belgium, France, Hong Kong, Ireland, Netherlands, Poland, Spain, Italy, Germany, Austria, Israel, Mexico, New Zealand, Philippines, Singapore, Switzerland, Norway, Saudi arabia, Ukraine, United arab emirates, Qatar, Kuwait, Bahrain, Croatia, Malaysia, Brazil, Chile, Colombia, Costa rica, Dominican republic, Panama, Trinidad and tobago, Guatemala, El salvador, Honduras, Jamaica, Antigua and barbuda, Aruba, Belize, Dominica, Grenada, Saint kitts and nevis, Saint lucia, Montserrat, Turks and caicos islands, Barbados, Bangladesh, Bermuda, Brunei darussalam, Bolivia, Ecuador, Egypt, French guiana, Guernsey, Gibraltar, Guadeloupe, Iceland, Jersey, Jordan, Cambodia, Cayman islands, Liechtenstein, Sri lanka, Luxembourg, Monaco, Macao, Martinique, Maldives, Nicaragua, Oman, Peru, Pakistan, Paraguay, Reunion.